Costuming-heavy clip show FursuitTV is holding a three-hour special today at 5PM EST (10PM GMT, 2PM PST, 11PM CET) to celebrate their fifth anniversary. The show is to contain this year's best clips plus new material, and can be seen via direct stream or JustinTV. Watchers can discuss the show in real time on #FursuitTV (Anthrochat). Fans of fur-heavy webcast FursuitTV are preparing for its 4th anniversary show, set to stream this Saturday at 10PM UTC (5PM EST) for up to three hours. 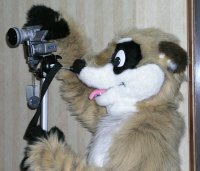 FursuitTV is created by Timduru with footage from ads, movies, media coverage, con videos and fan submissions. This month's edition will mix best-of clips from the past year's shows with all-new material. Joining #FursuitTV on Anthrochat (web client) is recommended for the complete experience. The show normally lasts an hour and airs on the first Saturday of each month.